You can setup call transfer feature at Ecsow menu Tools > Options > Call Transfer tab. 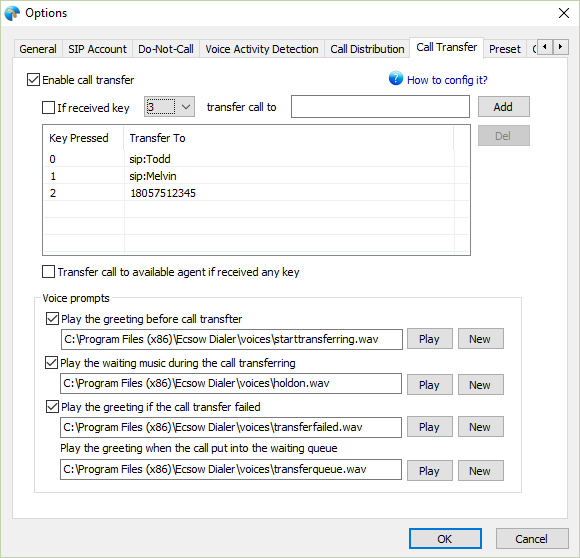 Notes: Please disable the “Automatic distribute to agent when detect human answer” and "Automatic distribute to agent when the call is answered" options at "Call Distribution" tab to make the call tranfer feature take effect. Where to set up country code/ region code in Ecsow Auto Dialer? How to act the Auto Dialer (Multi-line) as the Voice Broadcast System?